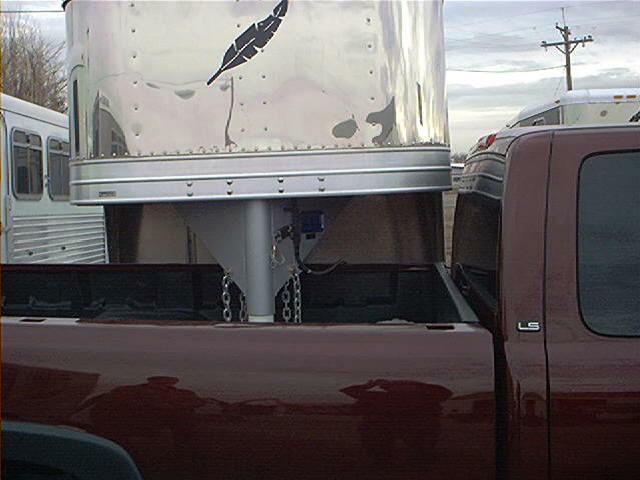 "Popup Gooseneck nine inch trailer extension for shortbed trucks, Towing Horse Trailers, gooseneck hitch coupler, prevent breaking truck rear window, gooseneck and fifth wheel towing products, gooseneck extensions, short bed truck hitch,Gooseneck conversion,gooseneck extension, gooseneck adaptor,5th wheel conversion,Popup Hitch,short bed hitches, short bed truck hitch extention solution for your gooseneck trailer, Cheap Popup Hitches." US Patent 6,629,700 Order below New lower prices!! 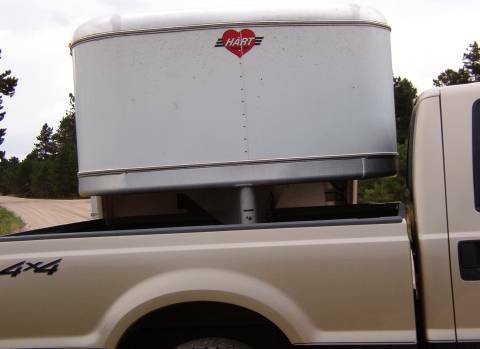 Gooseneck Trailer Extensions, all have Gross Trailer Weight rating of 24,000 pounds. • Gross Tongue Weight 6,000 pounds. 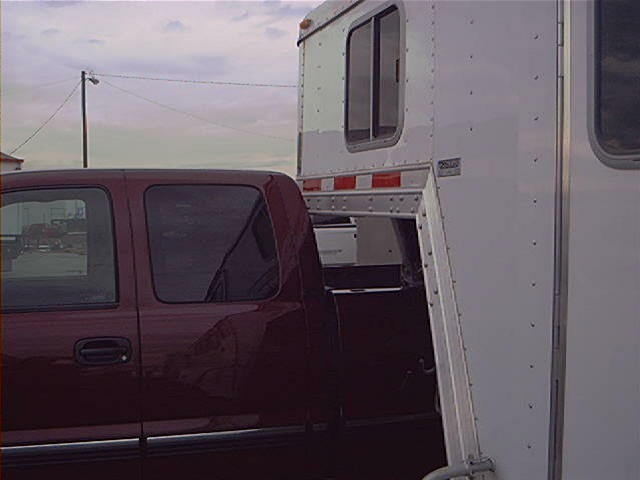 Gooseneck hitches and gooseneck extensions, recommended by "MrTruck"
An Extra Nine or Sixteen Inches Right Where You Need It. Or "how much does your trucks rear window cost?" 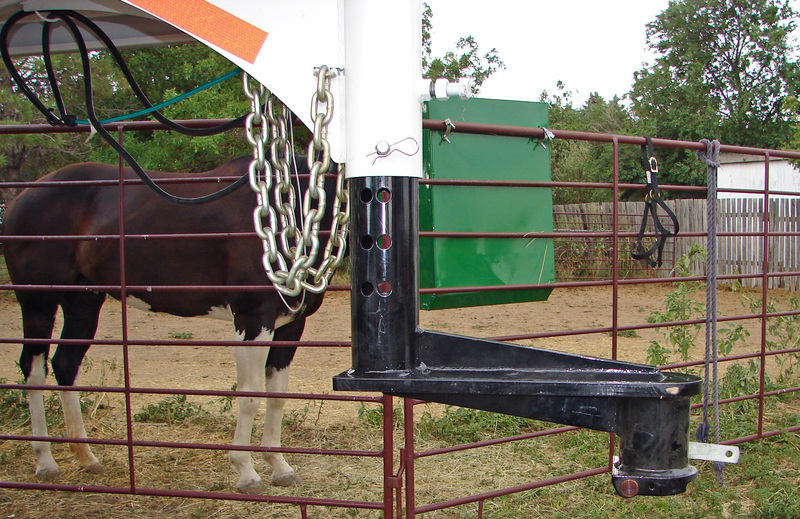 Short bed gooseneck extension coupler solution for Towing Horse Trailers and Race Car Trailers. 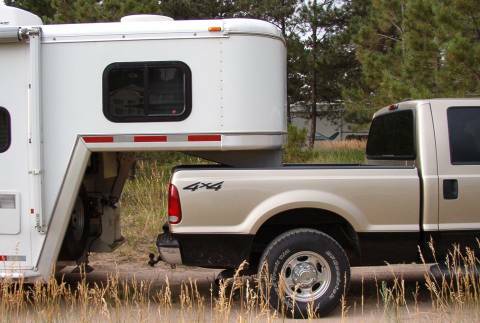 Questions or if you have answers call 303-883-1300 , "Great Prices on Popup Hitches"
Short beds are increasing their popularity while decreasing their length as with Dodge 2500/3500 standard bed at 6'3", Ford F250-350 bed is 6'8", GM 2500-3500 is 6'6". 1/2 ton trucks with crew cab can have a 5'6" bed. You still need the trailer weight far enough forward from your rear truck axle for steering control, balance, & efficient, effective brake & spring use. 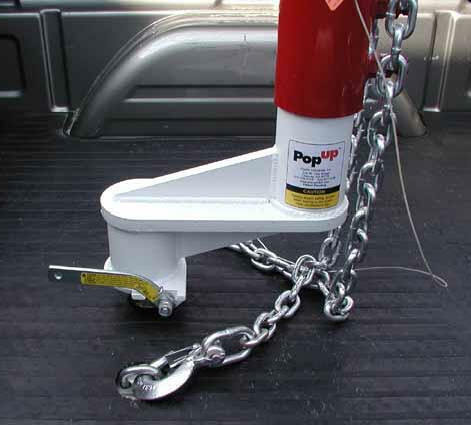 Popup gooseneck short-bed extension coupler. #SB1 drilled for the new Bull Dog side pinned coupler receiver or the two set bolt older style coupler tubes with the two set bolts. 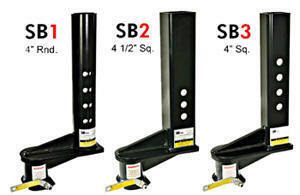 SB1 still has 9 inch extension for your short bed truck. $243 click to order Before you knockout your rear truck window, order now. 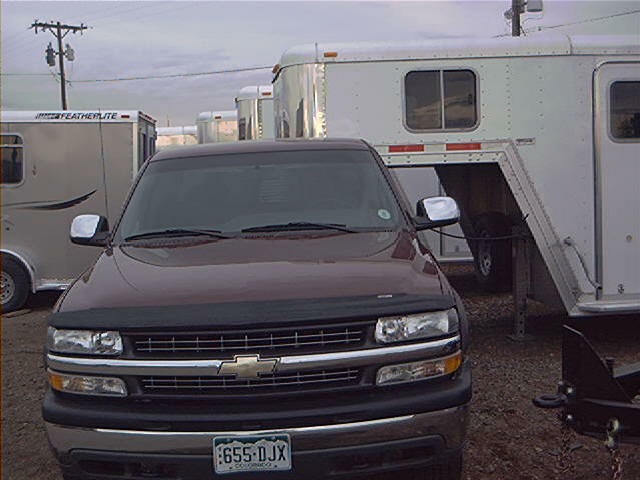 Call 303-883-1300 for information on how to measure your trailer. Gross Trailer Weight 24,000 pounds. • Fitted with 2-5/16” spring loaded coupler. • Coupler latches and unlatches remotely. • Coupler precision casting extends ball life. • Includes coupler release cable and hardware. • Installs in half an hour. 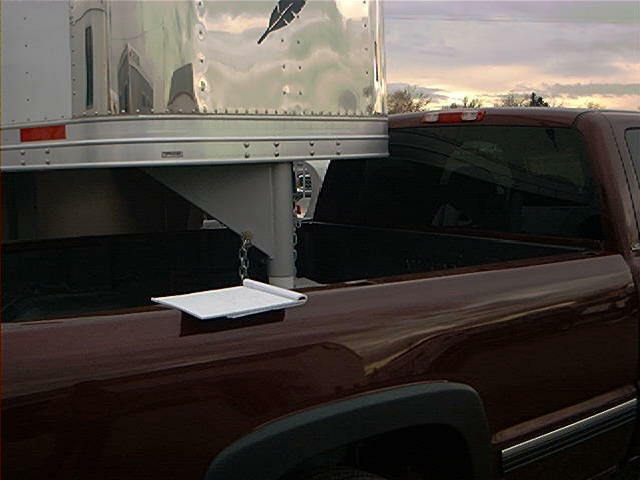 Order SB116 now... $297 before you need a rear truck window. Gross Trailer Weight rating of 24,000 pounds. Caution, the extra 16 inches may will put the trailer neck wing gussets closer to your trucks bed rail on turns. 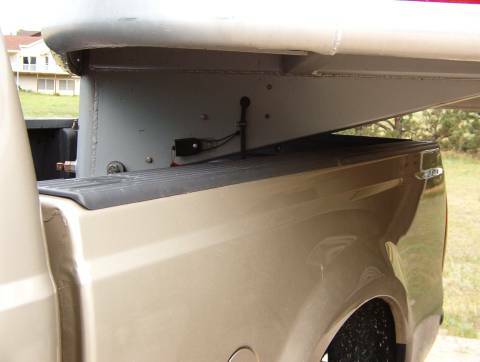 If you have large neck wing gussets you may want to measure 16 inches to the side and back to your trailer at 90 degrees to see what clearance you have. Trailers very with neck gussets. 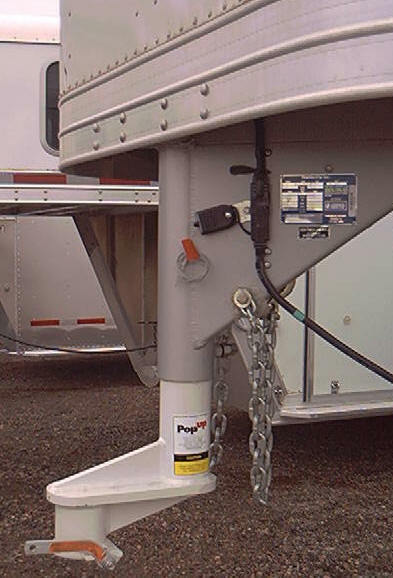 THE SB116 MUST ONLY BE USED WITH A SAFETY THRU PIN as most new gooseneck trailers have. 4-1/2 inch Outside Diameter, of the square tube that goes in the gooseneck. Before you order, measure your neck tube. Fits 4-1/2" square SB2 and 4" square tube SB3 below O.D. trailer coupler tubes. Includes coupler release cable and hardware. Gross Trailer Weight rating of 24,000 pounds. Gross Tongue Weight 6,000 pounds. Before you order, measure your neck tube. ....Now there's help for the short-short beds. New from PopUp, the SB216. The long short bed solution. It's "16" inches of extension. 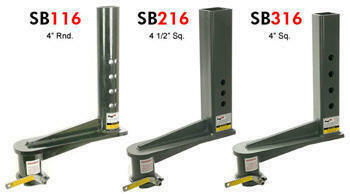 MrTruck price $309 Order SB216 now... before you need a rear truck window. 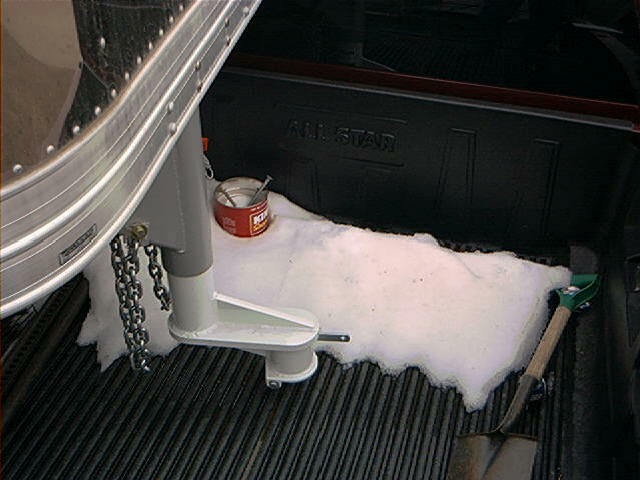 Order SB316 $309 now... before you need a rear truck window. Announcing the new XL Series of Extended Couplers designed especially for use with flat bed pickups having a recessed ball. We added 4” to the bottom tube between the coupler and the offset to give extra clearance above the flatbed. This will be a great benefit for your commercial customers many of whom have welders or other equipment mounted ahead of the ball on their flatbeds and need the extra 9” of room between the equipment and nose of their trailers. All are rated for 24,000 lbs GVWR and feature our popular self latching coupler with remote release cable and finished with durable black powdercoat finish. for trailers with 4"ID round tube $160 Order now..
GN6 has 1" holes thru both sides. GN7 has 1" holes thru both sides. SB6 has 1" holes thru both sides. SB7 has 1" holes thru both sides. Standard S.A.E. king-pin with 10" round bolster plate fitted to 18" long square or round tube. Durable Black powder coat finish. Fits standard gooseneck trailer coupler tubes. Just slides up the gooseneck tube. This is at 90 degrees against the cab further forward than you need. You also have more room between the tailgate and trailer. You know I like extreme tests! Who says I don't take notes! With newer hydro-formed boxed frame trucks, you may not be able to mount your ball in the truck bed where it does you the most good. This well built coupler from Popup Industries is a fast and safe solution to mounting the ball 2 to 4 inches ahead of your rear axle. 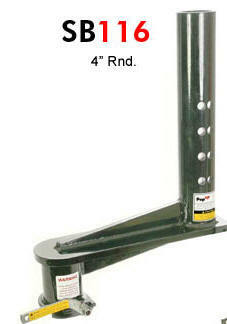 I like the ball 4 to 5" to allow all your truck springs, axles and bearings to be working for you. Having the proper "steering weight" on your front axle gives you better control. Your want your trailer level also, so the trailer can use all of it's springs, axles and bearings as well as have the maximum trailer brake available to you. 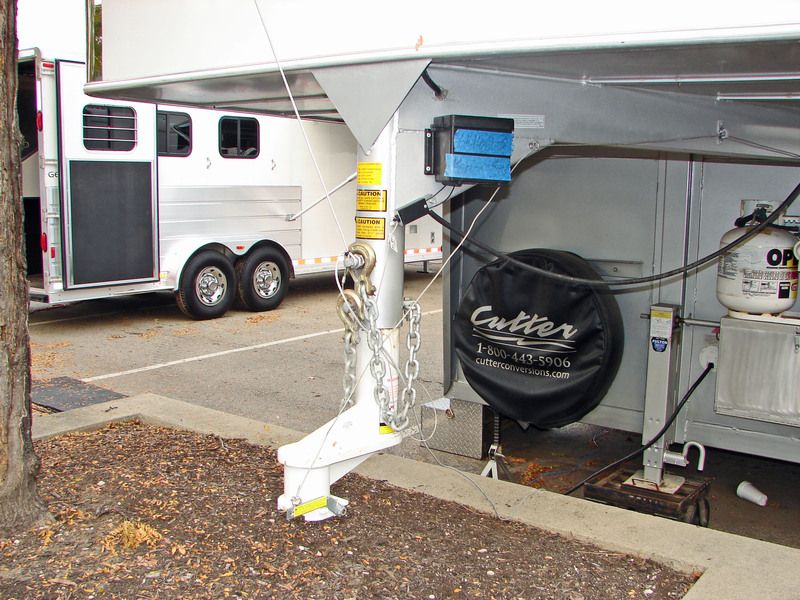 "I installed the SB1 extender on a Featherlite 4 horse trailer last fall and it has worked great. I can tell no difference at all in the way the trailer pulls or how it handles. We have a lot more confidence in maneuvering the trailer in tight spots, especially those 90 degree turns through narrow gates. I pull every weekend to a bird dog field trial some where on the east coast. It's a great product and a good idea. Jim J." You want to be able to distribute the trailer weight over all the axles of your truck and trailer. 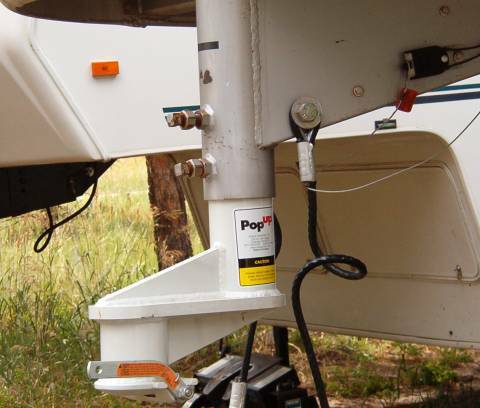 In the RV world there are several hitch companies that make "sliding mini-fifth wheel hitches." Ever see a sliding adjustable ball? This gooseneck coupler tube extension is built like a tank! 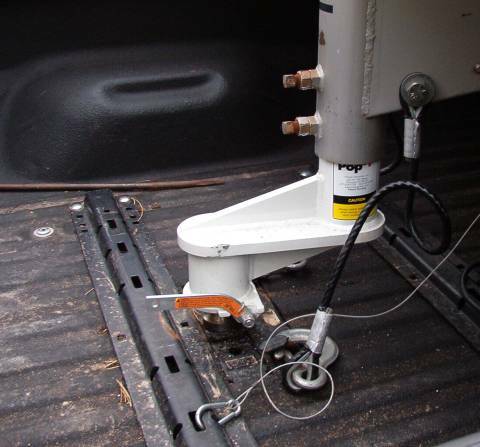 It comes with a spring loaded coupler, so you can pull the included cable to latch and unlatch your trailer without climbing in the bed. Yes I said 'without climbing into the bed." Another way to hitch a short bed. 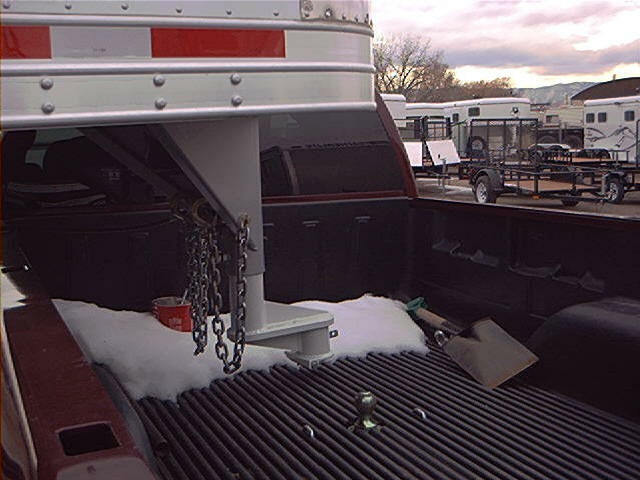 This will prevent hitting the cab of the truck with the trailer when jack-knifing. 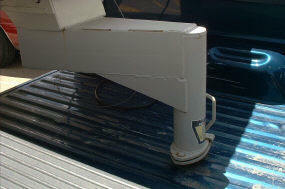 But how much would a welding shop charge to make an extension hitch and would they test it and stand behind it? What if it's welded at the wrong height? More Trailer Swing, Easier Hook-Up. 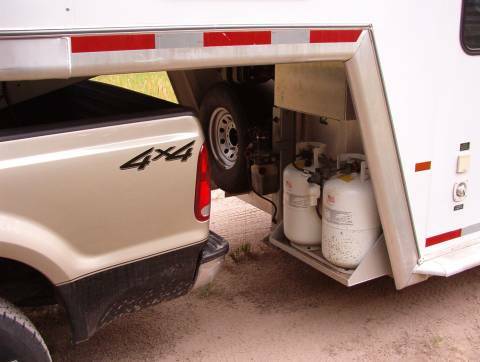 Everyone who tows a gooseneck trailer needs more clearance between the truck and trailer. 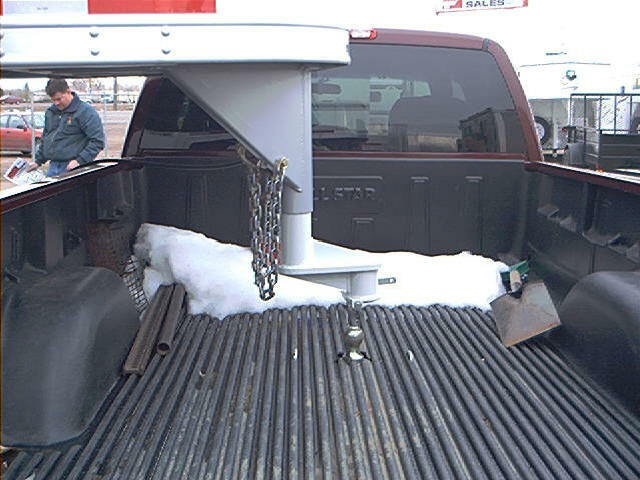 You either need more trailer swing for maneuvering, or you need more room at the tailgate for hooking up. Well, PopUp has a simple solution to this predicament. 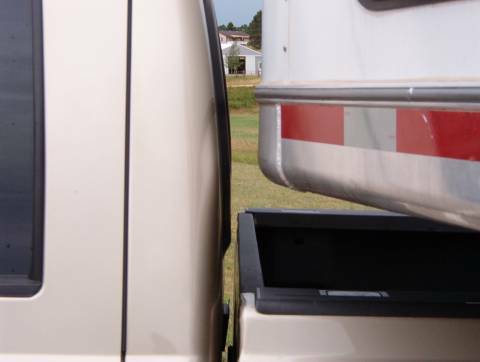 The new PopUp Short Bed Extended Coupler provides nine inches more clearance between the truck cab and the trailer nose, and between the truck tailgate and the trailer bulkhead - giving you more trailer swing and more room for hook-up. To make the towing experience better yet, this extended coupler latches and unlatches remotely. 3 3/4 inches from ball to top gusset against the trailer neck tube. That's how much clearance you'll have with the SB1 all the way up the trailer tube. The new PopUp Short Bed Extended Coupler fits standard round trailer tubes, square tubes and installs in about thirty minutes.